Description: This stamp is made by Hero Arts. This great Artist Garden stamp can be used for any stamping project! Description: This stamp is made by Hero Arts. This great Artist Tulip stamp can be used for any stamping project! Description: This stamp is made by Hero Arts. This great Purple Wash Flower stamp can be used for any stamping project! Description: This stamp is made by Hero Arts. This great Gold Wash Flower stamp can be used for any stamping project! Description: This stamp is made by Hero Arts. This great Pink Wash Flower stamp can be used for any stamping project! Description: This is a stamp by The River City Rubber Works Co. Large in size and perfect for making all your beautiful cards. Description: This stamp is made by The River City Rubber Works Company. It is the medium size Tulips. Great for layering in all the medium size baskets also sold here. Description: This stamp from Hero Arts is part of the Artistic Drawings collection. Called: Spring Tulips Sketch, this stamp would look wonderful watercolored. Size: 2 3/8" x 3 1/4"
Description: This stamp from Hero Arts is part of the Artistic Drawings collection. Called: Sketch Tulips, this stamp would look wonderful watercolored. Description: This stamp from Hero Arts is part of the Artistic Drawings collection. Called: Posy Sketch, this stamp would look wonderful watercolored. Description: This stamp is by Hero Arts. Great for cards and scrapbooking. Use together with other flower stamps or watering can stamp. 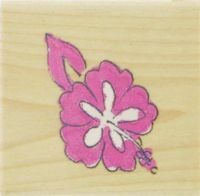 Size: 1/2" x 2 1/8"
Description: This is a large hibiscus wood mounted rubber stamp. Add this simple floral design to your cards, invitations, scrapbook pages, background paper or creative gift wrap to give a Hawaiian feel. 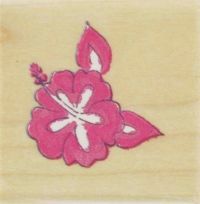 Size: Image size is 1 1/2" x 1 1/2"
Description: This is a small hibiscus wood mounted rubber stamp. Add this simple floral design to your cards, invitations, scrapbook pages, background paper or creative gift wrap to give a Hawaiian feel.